Canada’s Prince Edward County has dozens of fearless winemakers. Here are a few of the best. 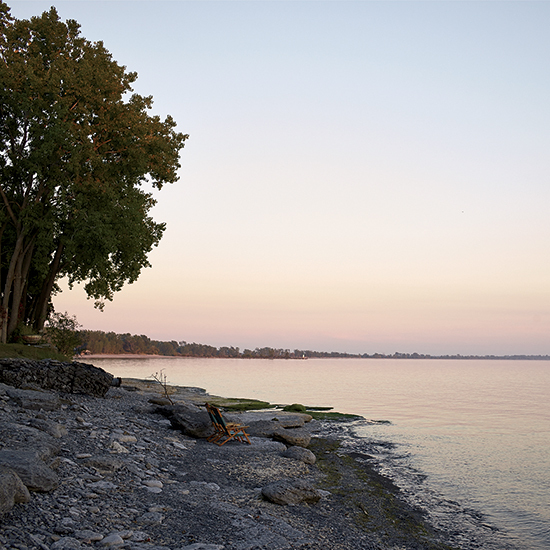 Canada’s Prince Edward County has beautiful beaches, a growing community of artists and artisans, and dozens of fearless winemakers. Some of the most intriguing wines in the world come from truly extreme places, like Sicily’s explosive Mount Etna or the vertical vineyards of Germany’s Mosel. Prince Edward County is extreme in its own uniquely Canadian way—which explains why it is arguably and improbably the most exciting young wine region in North America. I felt compelled to make a visit to try its focused, minerally Pinot Noirs and Chardonnays at the source. “The County”—not to be confused with mussels-laden Prince Edward Island off Canada’s Atlantic coast—is a 42-mile-wide island in Lake Ontario. It isn’t my Great Lake—a child of the Mitten State, I’ve spent every summer of my life on Lake Michigan—but each glacier-carved body of water has a powerful effect on the climate of its respective region: generous in the summer, brutal in the winter. In Prince Edward County, between the near-Arctic conditions that can last some six months and the hungry mouths of the giant flocks of swallows, grackles and starlings that cross the region on their migratory route, no one has any business trying to grow grapes. Happily, none of those daunting conditions are apparent on a late-summer day. From June through August, the County attracts visitors from Montreal and Toronto. The lines for blackcap-berry ice cream at Slickers in the town of Bloomfield can be half an hour long, and the extra-wide sand beaches fill up with families who pack picnics and stay all day. There’s yet to be a consensus about whether the wine followed the artists or the artists followed the wine, but recently the County’s long-established creative community has been growing. Plus, there’s been an influx of young entrepreneurs opening shops, galleries and restaurants. The fantastic renovation of Angéline’s Inn and the addition of the design-forward lakeside Drake Devonshire Inn should make the County a destination for travelers from all over. It was a cool and misty morning when I drove out to Long Dog winery. Rain soon electrified the bright green vines, making the cows shiny black against the foggy backdrop; everything smelled fresh. James Lahti, a tall, pale-blue-eyed winemaker, and his wife, Victoria Rose, are Toronto transplants who have lived in the County for almost 20 years. Both worked as film editors, and he still does, mainly on IMAX films—his most recent on the Arctic. I sat at the island in their lived-in kitchen drinking a glass of their silky, Meyer-lemony Chardonnay, while Flora and Fern, two wire-haired dachshunds (the namesake “long dogs”) lolled on the couch. Rose nonchalantly stirred a pot on her prized Garland stove, simmering a white bean and tomato soup that she topped with a big scoop of pesto made with ingredients pulled from her garden that morning. As a lover of wines from Austria, Germany and Italy’s Alto Adige, I’ve heard plenty about the adversities of those cold-climate regions: late frost, grapes that won’t ripen, ferocious hail. But what Lahti described was new to me: Because Prince Edward winters are so intense, growers have to bury their vines to protect them. They hibernate them. After harvest, growers take three or four of the canes (that year’s shoots) from each vine, pull them to the ground and attach them to a wire. Then a worker goes through on a tractor and “hills up” more than a foot of soil. Miraculously, the vines bounce right back when uncovered in the spring. “These vines are hard-wired; they know what to do,” Lahti told me. What compels Lahti and all the winemakers here to look beyond the weather is the remarkably fertile soil—a glacial gift. “This place is magical because it’s all old limestone, and that doesn’t really exist in the world between 43 and 45 degrees latitude,” he told me. “We have 165-million-year-old limestone. It’s what the French call calcaire; it’s all bones and shells.” The makeup of the soil is very similar to that of some of the best crus in Burgundy, as is the cool, damp climate, which is why Pinot Noir and Chardonnay reign here. We tasted from barrels in Lahti’s dusty cellar, the damp day accentuating the wines’ surprisingly terrestrial flavors, the “forest floor” quality Burgundy lovers adore. Visiting the Grange Winery’s vineyard, I practically dropped to the ground when I heard what sounded like three gunshots. “Bird banger,” Caroline Granger said, squeezing my shoulder reassuringly. Most growers in the County cover their vineyards in bright blue netting to keep hungry birds away, but Granger doesn’t: “I don’t want to stop the airflow. We need to embrace the environment. And I want to have easy access to the fruit.” Instead, she relies on the cannons to scare the birds off and came up with a new way to trellis the vines. We retreated into the enormous 1872 wooden barn that houses her cellar and an extraordinary high-beamed tasting room. Granger grew up playing in this barn, turning it into the setting for an imaginary circus. She was the first to bring grapes to the property, planting her vineyards in 1999. Granger’s 28-year-old daughter, Maggie Belcastro, her assistant at the winery, had made an incredible herbed frittata. “I know it’s bizarre to have a breakfast pairing,” Belcastro said, “but I’m obsessed with eggs and our Pinot Gris.” She is studying at the biodynamics school up the street, hoping to convert the vineyard, something that struck me as a significant challenge—but she was confident, unfazed. In truth, I didn’t meet one conformist during my time in Prince Edward County. It’s not exactly a place that breeds wimps and wallflowers; it demands scrappy farmers and big personalities. Norm Hardie—a lover of Champagne, Burgundy and loud music—may as well be the mayor. On this particular Sunday afternoon, most of the County was on the crush pad at his magnificent winery, a metallic structure that resembles an inflated Airstream. He uses the concrete slab in the middle of his Pinot vineyard to process fruit during harvest; but in the growing season he packs it with people drinking wine and eating pizzas from the big stone oven he had built by a local mason. Hardie poured me a glass of his vivid white blend, Calcaire, and brought me an Alsatian pizza that took a mere 90 seconds to cook in the hot oven. He told me the recipe was inspired by Laurence Faller, the renowned winemaker from Domaine Weinbach in Alsace who recently passed away. Here, Hardie’s chefs top the pies with house-cured speck and Canadian cheddar. “When people sit down and see the tanks and the vines and have the best pizza, possibly of their lives, they don’t forget about you,” he told me. I think he was downplaying the extremely gulpable quality of the wine. Hardie’s style of winemaking is relatively hands-off: He buys the best barrels he can, works with natural yeasts when possible and lets his white wines build layers of flavor by staying on their lees (dead yeast cells). He pulled a sample of his 2013 Cuvée des Amis, a single-barrel Chardonnay that he only makes in the best vintages. It shimmered in the glass and had an unmistakable orange peel note. Then we tried his 2013 County Chardonnay, and it was creamy and floral, markedly precise. It used to be that the only bar open year-round in town was the Elks Lodge—and everybody went to the Elks Lodge. Now, the restaurant at the Drake Devonshire in Wellington is the spot. The 13-room hotel smack-dab on the lake is a nexus for modern art and contemporary thinkers. Lest that sound obnoxious, it isn’t–it’s a blast. The building was an 1800s foundry-turned-inn that the current proprietor, who also owns the Drake Hotel in downtown Toronto, took down to the studs and rebuilt. The restaurant’s A-frame structure evokes a summer-camp mess hall that’s been taken over by artists; off to the side, there’s a screened-in porch with steps leading down to the rocky beach, where a bonfire awaits for roasting hot dogs. I sat for dinner under a beam that had been covered in neon crochet over the course of 24 hours by Brooklyn artist London Kaye. Chef Matthew DeMille’s dishes are comforting but creative, in step with the feeling of the whole place: Lake Ontario pickerel with crab and summer corn panzanella; a crisp pea salad dressed with maple syrup. I had a glass of Rosehall Run Vintner’s Daughter Chardonnay. After dinner, I headed to my room. The staircase was lined with 25 drawings of a local great blue heron, pieces commissioned by the Drake. The rooms are filled with retro furniture and diabolical paintings by Team Macho, a collective from Toronto. On my bed was a handmade rag doll and a purple woolen tweed blanket from MacAusland’s. Above the light switch, beside the armoire, I noticed a line of poetry on the wall: “like a small monk in a green monastery.” Hidden verses by local poet Al Purdy are written in little spots all over the hotel. That night, I slept with the screen door open. Even though I couldn’t see the lake, I could hear it lapping outside my window.